#422CustardFactory is participating in Birmingham's Open Studios, a glorious weekend of art shows showing off the work of nearly 100 artists, across 11 spaces and incorporating 5 additional one off events. It all kicks off riotously on Friday, August 3rd and carries on through Saturday, if you're intent on making a weekend of it. An Art riot for sure. Not forgetting Friday Aug 3 is the first Friday of the month so at least you can pad around Digbeth with tasty nosh in hand and tum too. Okay, so it's fair to say we love Joyce Treasure. Her new series of what I call small art for small homes, Hymns, each captures an iconic civil rights figures melded onto biblical scripts. Just don't get your Angela Davis's mixed up with your Michael Jackson's. Her large 'Know Yourself' canvas adorns the wall of Bearwood's coolest Why Not coffee shop. Oh, man! Joyce's work is a provocative, evocative delight. Can't wait to see what comes next. 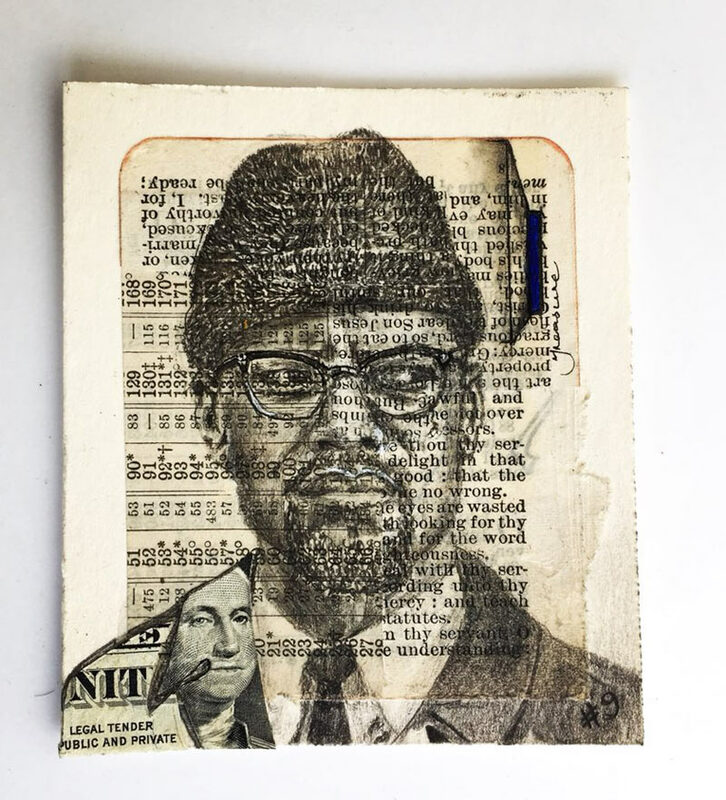 Here's what she says about Malcom X from her Hymns series "Here’s a little sneak at my portraits of Malcolm X especially created for Hymns. A small collection of miniature portraits that I have drawn for this event to mark the first year of my time here in Birmingham having completed year one of black studies course at Birmingham City University." One time fans of Disney will know well, It's a small world after all, and we have been hoping to feature Alexi K in outsideleft for a little while now. He's on been on our radar. And so what a great and pleasant surprise to see his work here. Meave, who owns our literary taste, recommended him after reading one of his short stories. For Birmingham's Open Studios Alexi's uncommercial commercial graphic design is front and center and eye wateringly good. In a good way. Also, love Alexi's plans to possibly alter his work, after they've been exhibited as he mentioned when blogging about his Concrete Trilogy displayed at the inaugural Birmingham Design Festival. Al Leeming says "I actively engage individually or collaboratively with projects of all sizes across a diversity of media, delivering innovative and effective communication for digital, print and environmental media. I’m passionate about my work, and the role of my work in a broader social context. Helping address big issues and subtle messages using design with emotional and cultural relevance to give them a powerful visual voice." Lucy Morrison paints in oil. And lucy's oil is a beautiful oil. Trad landscapes rendered so epically, for someone like me, who doesn't want to go outdoors, doesn't want to walk Englands coastlines, or woods, would at best look through a window, well... Lucy's paintings take me there, and beyond. Imagine. Even better than the real thing. Lucy's paintings are held private collections internationally and are exhibited extensively throughout the UK. 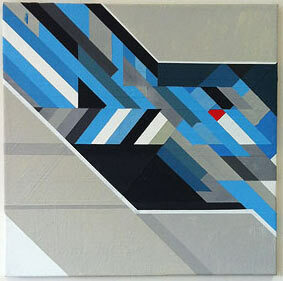 She's represented too by Gallery 104 in NY so you can buy buy buy, which I'd kinda recommend. 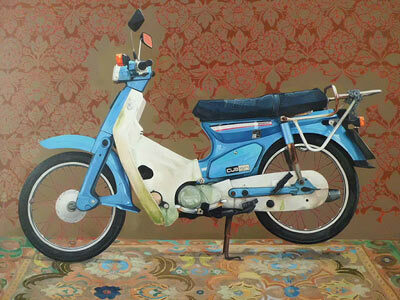 Stephen Earl Rogers is renowned for his supra hyper realistic painting in oil and the questions his painting pose. Rich eye candy. Would enhance any home. Parshotam & Sons leather goods would leave you in a lather such is there polished beauty. It's great to see traditional crafting techniques sitting so comfortably alongside the political and the pastoral and the rest. The Art of Winning at Three-Card Monty.